Any O2 pre pay phone will work with a contarct sim. You will need to enter in new MMS and GPRS settings but any O2 shop will give them to you. i-mode will work fine on any traiff, it works on both 3G and 2.5G handsets. O2 UK online store says it doesn't have a camera, is this true? Also standby time is listed as only 150h - those who already have this handset, is this realistic? I would be grateful for any more detailed reviews! If I buy this phone on O2 prepay, does anybody know if it will work with my O2 contract sim? O2 prepay phones do normally work with O2 contract sims, but I'm unsure about this due to i-mode as O2 are issuing i-mode tarrifs. If it will work with a normal gsm sim, will i-mode work or just the normal functions? for the live pic link, try go to images.google.com and search with "nec e121" keyword. @robert.newton: Sorry, link doesn't seem to work as intended and URL is truncated. Didn't find it myself on MR, help again? Thx! Where are you guys getting this phone from? It's not even out yet. Does anyone have a general idea of how much this phone will cost when it comes out? Cheerio. 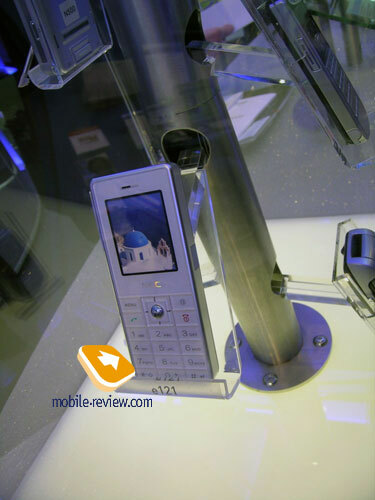 http://www.mobile-review.com/exhibition/image/20­05/cebit/nec/e121.jpg for live pic. Its the gsm version which has no i-mode. Is the back case a shiny metal like ipod or its just a plastic? and does the battery interchangeable? So, are there any live pics anywhere to be found? I am currently training out i Mode and this phone is outstanding! Managed to get hold of one of these phones and I can confirm it has a very good build quality and feel. I can't believe this phone weighs 95 grams!!! I thought it would be heaps lighter than that considering its size and minimal functionality. Perhaps the imode is weighing it up. Yep this phone will work in the USA.